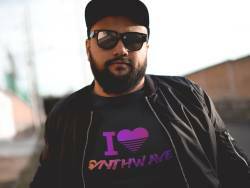 It was only several years ago when Raymond Garcia started his own synthwave podcast in May of 2016. As his podcast gained more and more popularity, Garcia naturally found himself wanting to monetize his show. That’s when he thought back to a service he’d been using since 2012: Spreadshirt. 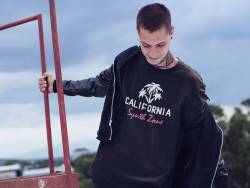 Garcia launched his Spreadshop in August of 2018, and he’s already seen some success in such a short time span. 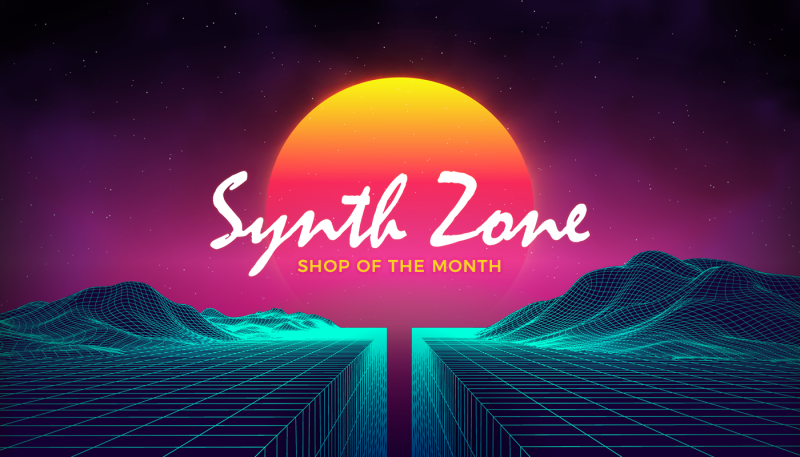 Thanks to his success and innovative path, we’re featuring the ‘Synth Zone’ as our Shop of the Month. If you’re hoping to launch your own Shop or take your existing Shop to a new level, then take a look at the tips and insights that the radio personality provides. How did you first become aware of Spreadshirt? What made you decide to open a Shop? Why did you decide to start monetizing your show through branded gear? I’ve been a fan of Spreadshirt for many years, so me opening a Shop on the site was a no-brainer. I started building the shop back in August of 2018. I officially launched it on September 17, 2018 and I announced it through my Instagram and Synth Zone Facebook page. 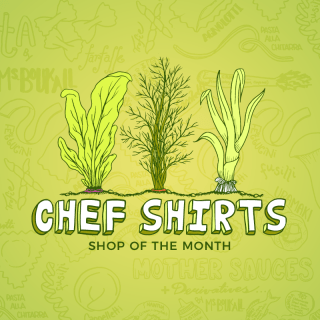 I decided to start selling the merch through Spreadshirt mostly because the listeners wanted it. To be honest, I was resentful at first, but with a little faith in my listener base and brand, I was able to monetize it. The style of your gear has a very “Miami Vice” or “Cali” feel to it, including bright colors and unique typography. What factors led to you landing on this specific style? The style I was going for is heavily inspired by 80’s movies and shows, but with a modern twist. We can’t deny the fact that “retro is in,” so I wanted to capitalize on that by merging the old-school look with a new-school style. I wanted anyone to wear my gear, even if they are not avid listeners to the show. The Synth Zone logo was the first thing I made when I was making the show, and to be honest, it was fairly easy because I saw it in my head way before I put it on print. I borrowed the same font that was used in the movie “Drive,” and I just implemented that style into my show logo. I also wanted to represent where I was from. I love California, it’s my home state, and my listeners constantly write to me about how they wish they could be in California. 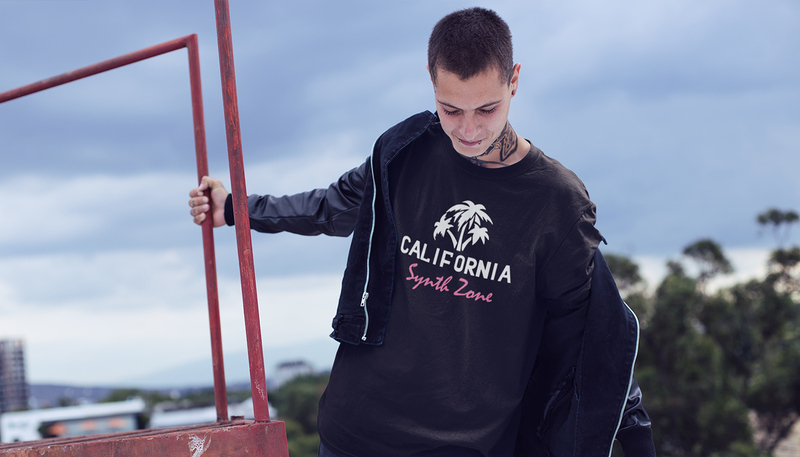 In retrospect, I wanted to give a little bit of that California feel to the people who want to support Synth Zone. Do you create the designs yourself? Have you always had this artistic ability? Yes, all the current Synth Zone designs were made by myself. I have also used some designs graphics provided by Spreadshirt, as well. I wouldn’t go as far as to say that I have artistic talent, but I can say that I’m decent at Photoshop. 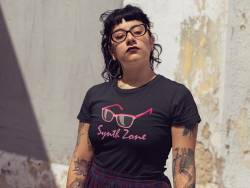 These last couple of months, I’ve been receiving help with concept designs and design inputs from my close friend, Jasmine Perez out in San Diego. She has more artistic talent then I do, and she’s just been a great supporter on everything I do. How do you decide which designs you’re going to sell? Are they inspired by existing logos, customer suggestions, etc. When I first started the Shop, I chose to stick with a minimalistic approach to the Synth Zone designs. Lately, listeners have been sending in ideas on what they would like to see on merch. Some of my listeners have even suggested that I put some slogans on shirts, since I seem to use a lot of 80s-style slogans on my show (which are hilarious to me). I’ve been really interested in vaporwave art concepts, as well (vaporwave is another subgenre of synthwave), and I’ve been loving the retro feel of that. 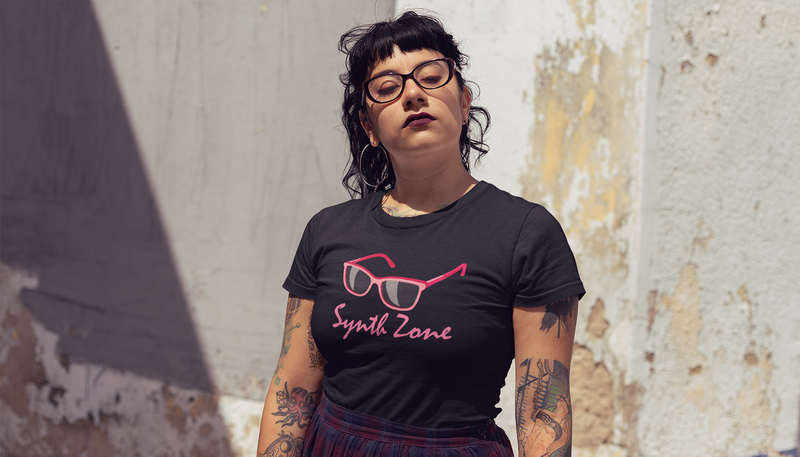 The Synth Zone logo is the best-seller at the moment. It’s just the logo on a black shirt, which makes it stand out. 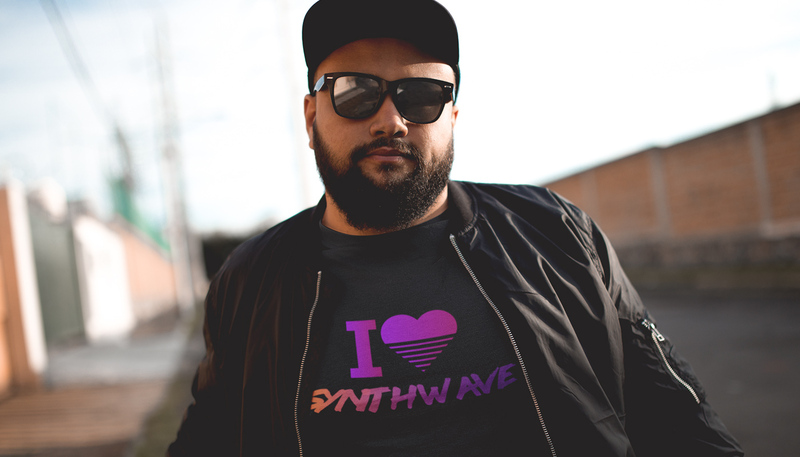 Funny story: when I first wore that shirt, I went to my first synthwave concert in downtown San Diego and I kept getting amazing compliments about the shirt. People kept asking where they could get one; some people even recognized the logo, saw my face, and put two and two together. It was pretty cool! Through my phone, I was able to easily show them where they could pick up a shirt. You do a nice job of marketing your designs on social media. Do you subscribe to any specific marketing strategy (i.e. promotions)? Which ones? Have they proven to be effective? When I was thinking about a marketing strategy, I wanted to be simple without blowing up people’s social media feeds with spammy links to my Shop. So, what I decided to do was promote it slowly. I first announced that a merch shop was in the works on the show, and I posted the first pictures on my Instagram and Synth Zone Facebook page a few weeks later. When the Shop launched, I sent a link to only the listeners who specifically reached out about merch. That ultimately led to my first sales. I then requested that my customers send me a picture of them wearing the merch so I could post it on the social media pages…that boosted everything. 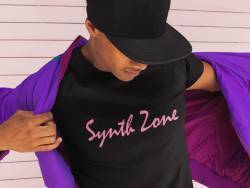 Once musicians, artist, and producers from the synthwave scene started buying the merch and spreading the word about Synth Zone, that just helped self-promote the brand. How did you gain so many followers on your social media platforms? I honestly wish I knew. My best guess is that big influencers are sharing my posts. I do tend to get a spike of followers on all my platforms when any synthwave artist shares my post. I have not used paid advertising or paid for post boosting; so far, all my social media post analytics have been organic. My biggest presence is the Synth Zone Facebook page, which gets the highest post ratings. More recently, I have been focusing on my Instagram page as my second social media presence. This is especially helpful when it comes to selling merch, because fashion seems to sell more on Instagram than any other platform. At some point this year, I do plan on using paid advertising on Facebook and Instagram to help boost the merch sales; I do see the benefits of using those methods in the long run. I’m just waiting for the right time to put those into effect…and right after the holidays does not seem to be the right time. Perhaps when we have more designs to offer this spring I’ll start to gamble on some paid advertisement. I check my Spreadshop about once a day. I don’t really have to at this point, but I do anyway; I think it’s a healthy habit for me. I try and upload a new design every month, but it really depends on my work schedule and free time. Luckily, these last couple of weeks I’ve had a decent amount of free time, so I have been using that time to come up with designs and promotion ideas. To have a hot seller! 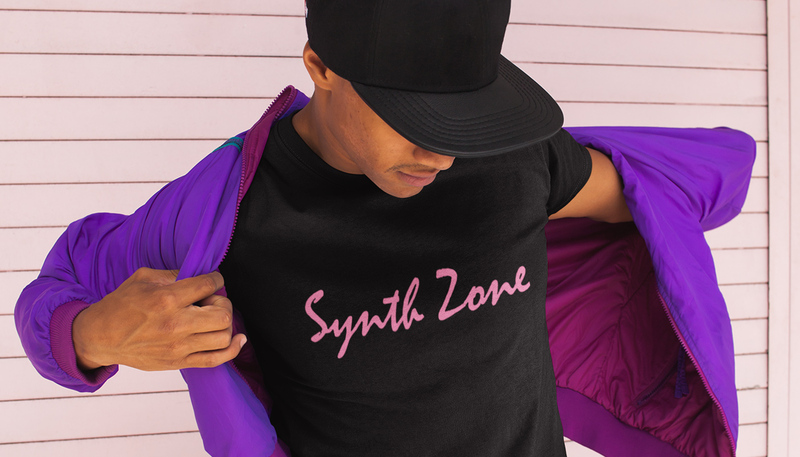 I’ve been thinking about this for some time, and I just want to make great designs; merchandise that not only represents Synth Zone but the whole synthwave movement. I have many goals for the Shop, but the one I can share with you now is to get more artists wearing and sharing my brand. This would give me the stamp of approval from the real heroes of the synthwave movement! Do you have any helpful tips for those who are new to Spreadshirt? 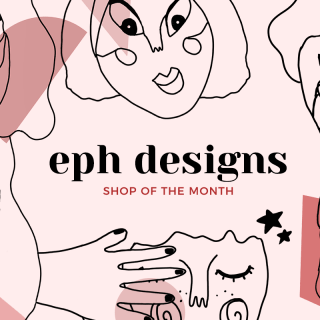 SELF-PROMOTE YOUR DESIGNS! Believe in your designs and make stuff that you would wear yourself! It’s really easy thanks to Spreadshirt! All it takes is just a little bit of time and imagination. You never know…you may have a bunch of people rocking your designs, and it’s the best feeling in the world when people get excited for something you made! What advice do you have for radio hosts (or any other creative-minded individuals) who are looking to monetize their shows (or creative outlets)? BELIEVE IN YOUR BRAND! And pay attention to the people who support your show! They will help you figure out what you should be creating and selling. Ask your listeners what they want to see. Social media is such a helpful tool for getting information and promoting your brand. Just know your audience, and once you know that, then you’ll know what your brand is! Many thanks to Raymond for participating in the interview. For more from him and the Synth Zone, check out his Instagram and Facebook page.